Fiat's Lingotto factory was completed in 1923. Unlike any other automobile factory to date, the factory featured a spiral assembly line that moved up through the building and a concrete banked rooftop test track. In the wake of World War I, when Fiat returned to making cars they held 80% of the automotive market share in Italy. Aside from a brief employee communist uprising in 1921, things were going well at Fiat and the company was ready to expand. The Lingotto factory in Turin you see here is the result of that expansion. Building of the Lingotto factory began while World War I was still raging in 1916. 7 years later, in 1923, Lingotto was completed and ready to open for business. It was the biggest automobile factory Europe had ever seen and was the second largest in the world. Upon its completion Lingotto instantly became of a symbol of Italy's proud manufacturing history. Only Ford's massive River Rouge Factory Complex could compare in size and scale. Designed by engineer Giacomo Mattè-Trucco, the Lingotto factory was one of the first buildings of its size to rely heavily on reinforced concrete in the construction process. The five story building featured a simple loop rooftop test track with two banked turns that consumed a 1620 foot x 280 foot portion of rooftop. 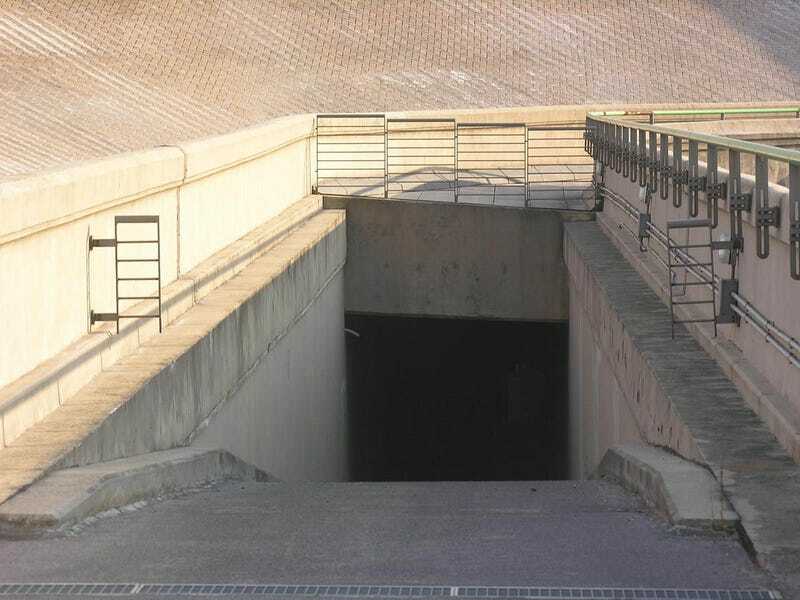 The test track's banked turns were constructed from an intricate series of concrete ribs in a construction technique that had not been used frequently before Lingotto's construction. It is safe to say the technique had never been used for a test track 6 stories in the air. 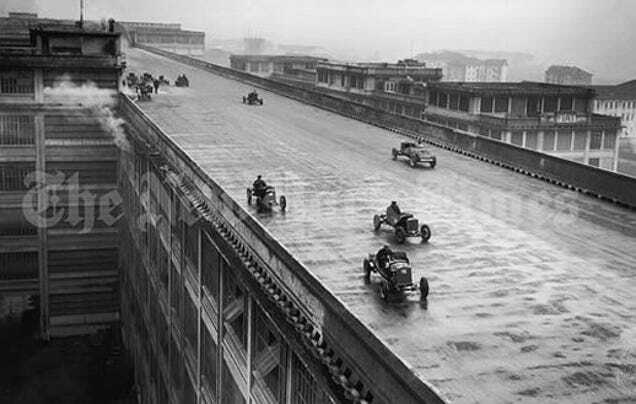 The roof top test track at Lingotto was not a novelty or an afterthought, but an integral part of the manufacturing process. The Lingotto factory featured a unique upward spiral assembly line. As each Fiat was put together it would progress upwards through the building story by story. Each floor was sequentially designated to specialize in a major part of assembly. What would start on the ground floor as raw materials and individual parts became a running driving Fiat by the time it spiraled its way to the top of the building. When a Fiat had finished its climb through the 16,000,000 square feet of Lingotto it exited the building by way of the roof. Each Fiat was taken on to the roof and around the banked race track to make sure the prior five floors of manufacturing had done their jobs to satisfaction. If the car was satisfactory, it would return down to ground level through one of the two spiral access ramps at either end of the test track. The Lingotto test track became as well known as the factory it sat on top off in its day. The track was certainly the only one of its kind and honestly, how cool is having a rooftop test track? The Lingotto test track was even briefly featured in the Italian Job. During the famous escape sequence the red white and blue Mini's go 3 wide on the banked rooftop race course with police in hot pursuit. In the hundreds of times I watched that scene it had never occurred to me that the track really was on a roof. If you have a Fiat 124 sport spyder, or a Topolino or any Fiat made between 1923 and the 1970s, it is possible the first miles your Fiat traveled were around Lingotto's roof top test track. 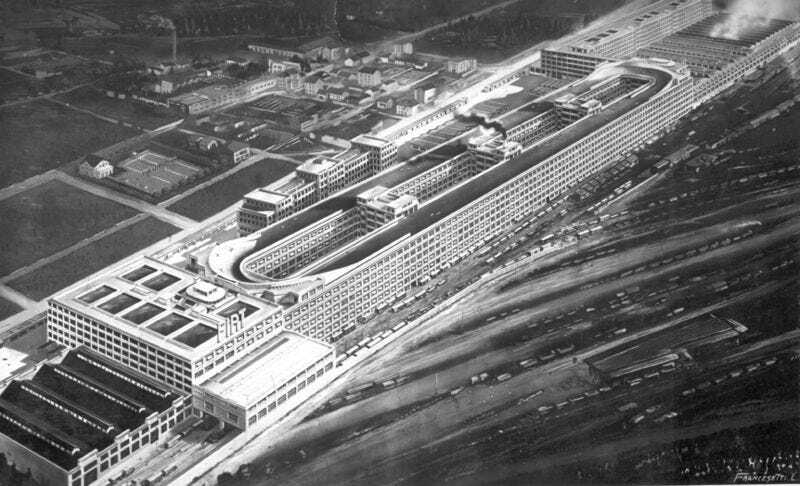 The Lingotto Factory was responsible for a large portion of Fiat production from it's opening until the 1970s when the design of the factory outdated it with contemporary automobile manufacturing techniques. In 1982 the factory was officially closed and the last Lancia Delta rolled off the line in Lingotto. Normally you would expect to see pictures of a slowly decaying abandoned plant. 28 years after it closed you might think this building that was once of the cutting edge of technology may have been forgotten. This is one of the rare occasions where this is not the case. A few years after the Lingotto factory was closed the building was reimagined and redesigned as a massive public space. The factory now features shopping, a theatre, a convention center and an upscale motel. Even the roof top test track is still intact, being used primarily as a meeting space for companies and car clubs, as well as a tourist attraction. 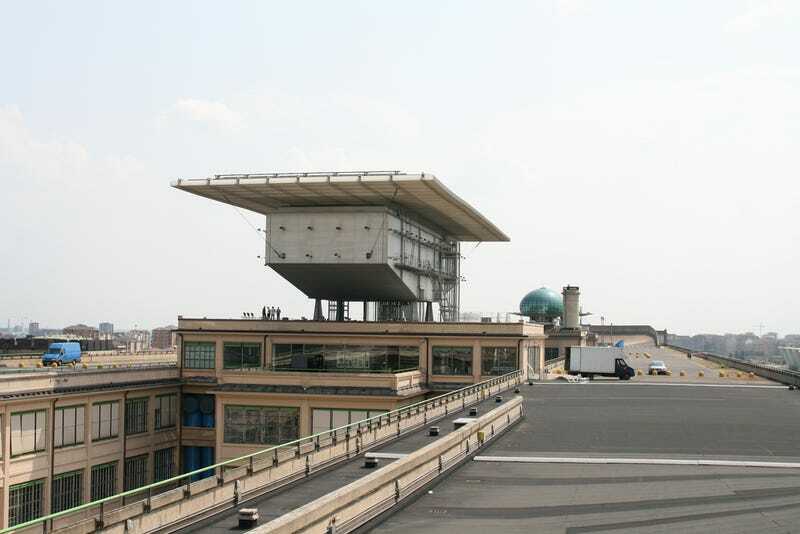 Although it is disappointing the days of rooftop car testing are done (not even a rooftop track day), it is nice to see the rooftop test track and the historic Lingotto building are being used and taken care of in a manner befitting such an important and awesome structure.